House of Seafood was established in April 2008. Since then, it has become a food icon and the famous brand in the seafood restaurant industry in Singapore and overseas. Today, they are well known as a great place for friends and families to enjoy a sumptuous meal together. House of Seafood serves up its finest range of seafood and the most delicious appetizing crabs to their customers. Their Chili crab has been promoted by The Singapore Tourism Board as one of Singapore’s National Dish and can be found in seafood restaurants all over the island. It is traditionally eaten with bare hands as a means to savor the juicy crab meat with its sweet and spicy chili sauce. And “CNN Go’ listed Chili crab as one of “World’s 50 most delicious foods”, at Number 35. It was one of the Singaporean dishes featured during Singapore Day 2011 in Shanghai, China, where many Singaporeans overseas go to try the signature dish. The Amazing Race 25 and The Amazing Race Asia 4 feature a task that requires cracking a specified amount of Chili Crabs (i.e. two pounds for the American version and one kilogram for the Asian version). House of Seafood’s “Beauty In A Seafood Pot” gives you the chance to enjoy the best of both worlds; 6 Tasty Fresh Seafood + Collagen Soup! The Beauty In A Seafood Pot contains the finest seafood ingredients such as fresh squid, scallops, prawns, bamboo clams, mussels and Sri Lanka Crab. These varieties of seafood really defines the meaning of a scrumptious meal. Every seafood is as though it is just caught alive from the ocean. The sweetness of the seafood lingers after every bite. 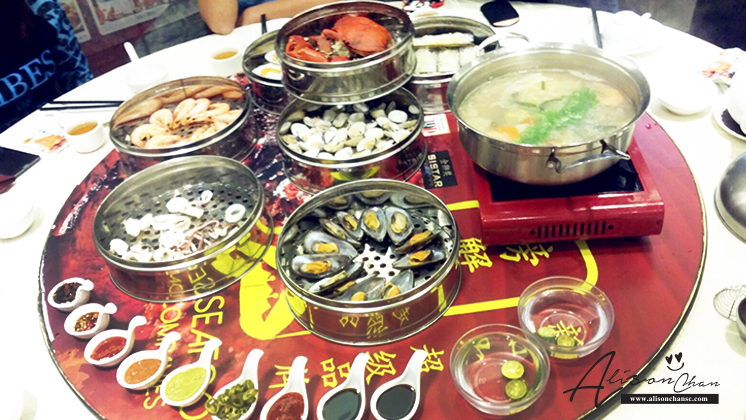 Not only does the food taste delicious, it is also leaning on the healthier side as all the seafood is steamed. And after completing the tower, you get to enjoy what lies beneath; the collagen soup! With a touch of briny taste of the ocean! The soup base is really sweet and heavenly. Once you get a taste of it, you will understand how luscious it is.